This classic pork egg rolls fry up crisp and golden. 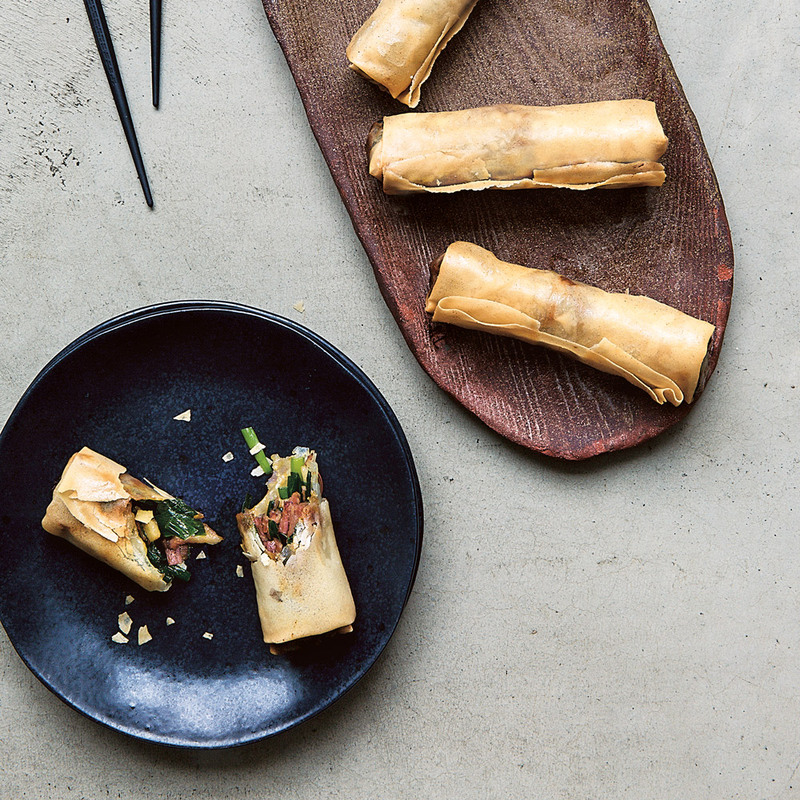 This recipe originally appeared in CHINA: THE COOKBOOK by Kei Lum and Diora Fong Chan. Heat 1 tablespoon oil in a large skillet (frying pan) over medium-high heat, add the pork, and stir-fry for 4–5 minutes until cooked through. Combine the salt, soy sauce, and wine and add it to the mixture. Stir-fry for another 1 minute. Adjust the seasoning to taste, then transfer to a plate and set aside to cool. Place an egg roll wrapper on a cutting board, place a portion of filling at one end, and roll the wrapper into a 4-inch/10-cm-long egg roll, folding in the edges as you roll. Repeat with the remaining egg roll wrappers and filling. Combine the cornstarch (cornflour) with 1 tablespoon water in a small bowl. Dab the edges of the egg roll with the cornstarch water and seal. Heat the 2 cups (16 fluid ounces/475 milliliters) oil in a wok or deep saucepan to 350°F/180°C, or until a cube of bread browns in 30 seconds. Carefully lower the egg rolls into the hot oil, in batches, and deep-fry for 2 minutes, turning, until golden and crispy. Use a slotted spoon to carefully transfer the egg rolls to a plate lined with paper towels. Serve immediately.